School groups who visit the Museum have two field trip options. For details about these options, please go to Plan Your Field Trip. All groups of 10 or more (including adults and seniors) must schedule their visit to the Museum through the Capital Area Visitor Services. Groups who would like to include a visit to a 3D movie must first schedule their Museum visit through Capital Area Visitor Services. 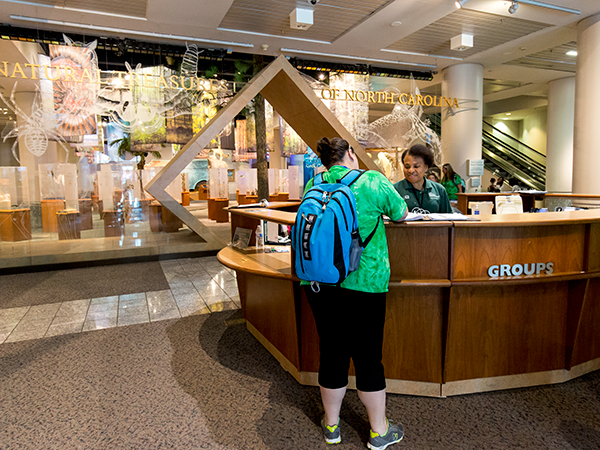 After receiving a confirmation number, the group leader should contact the Museum Box Office at 919.707.9950 to make reservations. Groups with special needs can make arrangements for programs or tours tailored specifically to their needs. For more information, go to Accessibility. School groups who visit Prairie Ridge can schedule a fee-based student program. Information about scheduling a field trip to Prairie Ridge. Any non-school groups who wish to visit Prairie Ridge, the Museum's outdoor facility off Reedy Creek Road, should contact Bonnie Eamick at bonnie.eamick@naturalsciences.org or 919.707.8879 for more information or to schedule a visit.